The wide-ranging GrazMuseum programme for adults includes regular overview and in-depth thematic tours in German or English as well as workshops and exhibition discussions on all current exhibitions. In addition, we offer guided tours by experts and special educational formats that address the various interests and needs of visitors. Special appointments for private groups or individual visitors can be arranged at any time. The opportunity to take part in a guided tour of the exhibition(s) is offered every Sunday at 3 p.m. as well as on special dates which can be viewed in the current programme. Every Sunday at 3 pm, you have the opportunity to follow our cultural educators through the new permanent exhibition “360GRAZ | The City in All Times from All Perspectives or the respective current special exhibitions. Registration is not required, just follow the guide! Coming, going, staying, moving on—urban history is always also a history of movement, of moving in and moving away. Migration is part of the history of Graz. In this dialogic tour, different aspects, from the multi-ethnic state of the Danube Monarchy to today’s migration movements, are examined. Selected objects make the cultural, social and language diversity of Graz visible and raise awareness for the understanding of migration as an essential part of the city’s history. Opportunities and rights have always been very unequally distributed in society. A look at gender relations from the Middle Ages to the 21st century makes this particularly clear. Starting from objects of Graz’s city history and everyday experiences, the thematic tour looks at how images of masculinity and femininity have changed and which personal and political struggles preceded or followed them. Visitors and viewers are offered the opportunity to take a close look at social power structures in historical and contemporary Graz and to examine connections between gender, social position and historical context. On some Sundays, figures, objects and pictures come to life in our permanent exhibition “360 GRAZ”. In a shadow theatre, we jointly get the historical figures to speak and control the view of the urban history of Graz. Join us with your family on an enjoyable search for clues through the GrazMuseum. There’s a lot of history going on there! For people of all age groups, from toddlers to senior citizens—registration is not required, just follow the guide! The permanent exhibition “360 GRAZ” deals with numerous collection objects different aspects of Graz’s city history. What did Graz look like in the past? Which favourite places do you have in Graz today? What do these have to do with the history of Graz? We move through time together and find connections between history and personal living environments. Selected objects illustrate the cultural, social and language diversity of Graz. In an easy language and open to the individual and spontaneous interests of visitors, we look at individual objects in the exhibition “360 GRAZ – The Story of Graz”. This format is interactive and leaves plenty of room for different needs and a lively exchange. A film in which one sees the city centre of Graz 110 years ago, the old Puch bicycle and much more invite the viewers to reflect on Graz and its stories. These guided tours offer newcomers to Graz the opportunity to get into conversation in the museum and to take a look at the history of Graz. They illustrate a multi-voiced approach to history and the shapeability of gender relations. The German-language tour is interpreted into Arabic or Farsi/Dari on the spot and takes place monthly in cooperation with the Austrian Integration Fund (ÖIF) and the Department of Integration of the City of Graz. Museum objects are ideal for language exchange, finding words and learning German. In this tour format, the focus is on the participants’ spoken German. They are invited to describe objects selected according to their own preferences with the available language skills. What do we see? What’s this? When was it? What is different or similar today? The museum’s pictures and objects serve as a source of inspiration for cultural and linguistic exchange. For beginners, the focus is on naming and describing. Advanced learners are encouraged to talk about links to other historical or cultural perspectives. Ideal group size: 12 people. Larger groups will be split up. Suitable for beginners and advanced learners. The GrazMuseum has to offer something special in the inner courtyard of the Palais Khuenburg—the extraordinary collection on display of the Phamacy Museum. The Pharmacy Museum can be visited on request, and we are happy to arrange individual guided tours. Museum and children? This agrees particularly well with the GrazMuseum. No matter if in one of our guided tours with their parents or already alone in one of our workshops—children are always welcome visitors in the GrazMuseum. Communicating our exhibitions we orientate ourselves very closely to the content, which has actually been conceived for adults, yet we shape it into a form appropriate for the needs of our young visitors—child-oriented, sophisticated but also pleasurable! By the way, admission to the GrazMuseum is free for everybody under 18. More than 100 years ago, many houses in Graz were demolished. Before the demolition, the houses were photographed. We compare the old photos with the current situation in the city. How is Graz changing today? Using various camera techniques (instant camera, camera obscura, smartphone) we take a close look at the city and create our own carefully selected cityscapes. 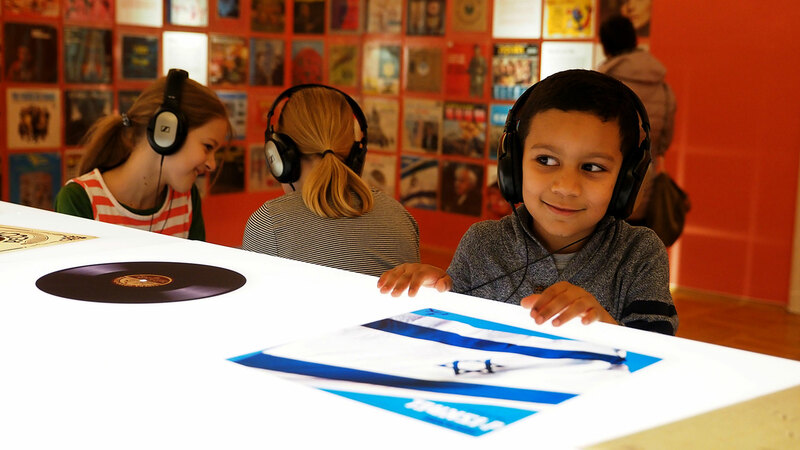 History workshop, pharmacy workshop or an activity tour through one of the current exhibitions: The programme for the party at the GrazMuseum is best chosen by the birthday child on his or her own. A museum workshop combined with a celebration in the arcade of the GrazMuseum takes centre stage. The birthday cake is to be brought by the birthday child, everything else is provided by the museum. Individual dates are possible, preferably Thursdays and Fridays from 2.30 pm to 5 pm. There are many stars in our theatre play with the history of Graz: 16-year-old Arnold Schwarzenegger, the cookbook author Katharina Prato or the Ottoman of Palais Saurau. During the history workshop we bring them to life, make costumes and slip ourselves into the roles of the historical characters. This workshop is perfectly suited for young and very young museum visitors. Specific topics are forms of medicine and effect of different medicines. On a more general level, the subject is the pharmacy from a cultural-historical perspective—prepared in a way suited for children. During the workshop, participants mix their own skin cream using historical weighing and measuring devices. The group is accompanied by two cultural educators of the GrazMuseum and is split up during the practical activities. The GrazMuseum offers a wide variety of specials for working with schoolgoers: dialogic, impulse, and special thematic guided tours as well as workshops, art conversations, and individual project days and activities. Guided tours and workshops are prepared for all types of schools and in an age-appropriate manner. We are also happy to arrange a tailor-made package for you and your pupils. Basically, you can visit our museum with a school class anytime within our opening hours. If possible, please register at least one week before the preferred date. History is fun. History makes you smart. In this activity tour, we embark on a time travel through Graz. A flying object takes us back in time, where we discover the Schloßberg fortress with many small details. What significance did the Schlossberg have for the city? And how has Graz become a big city? Was life in the city completely different from today? Diese Aktivführung regt die Teilnehmenden an, Objekte auszuwählen, zu bewerten und idealerweise mit eigenen Fragestellungen zu verknüpfen. Viele der Objekte verweisen auf Ungleichheiten in der Gesellschaft oder auf geschlechtsspezifische Perspektiven. Die Schüler/-innen bestimmen den Weg durch die Ausstellung selbst mit und erfahren Geschichte als vielschichtiges Konstrukt. Chancen und Rechte waren und sind in der Gesellschaft sehr ungleich verteilt. Der Blick auf Geschlechterverhältnisse vom Mittelalter bis ins 21. Jahrhundert macht dies besonders deutlich. In der Themenführung betrachten wir ausgehend von Objekten der Grazer Stadtgeschichte und alltäglichen Erlebnissen, wie sich Bilder von Männlichkeit und Weiblichkeit gewandelt haben und welche persönlichen und politischen Kämpfe dem vorausgegangen beziehungsweise gefolgt sind. Besuchern und Besucherinnen bietet sich die Möglichkeit, einen genauen Blick auf gesellschaftliche Machtstrukturen im historischen und gegenwärtigen Graz zu werfen und Verbindungen zwischen Geschlecht, sozialer Position und historischem Kontext zu betrachten. History is fun. History makes you smart. In the GrazMuseum, we embark on a time travel through Graz. A flying object takes us back in time, where we discover the Schloßberg fortress with many small details. What significance did the Schlossberg have for the city? And how has Graz become a big city? Was life in the city completely different from today? The class is accompanied by two cultural educators in this activity tour. The accompanying teachers receive a materials folder for the follow-up at school. 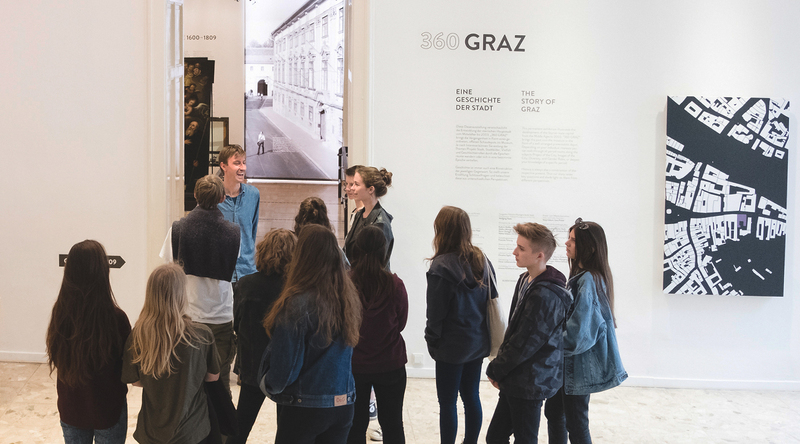 The permanent exhibition “360 Graz—A Story of Graz” offers school students a large collection of historical material that they can turn and turn around according to their own purposes. The activity tour encourages the participants to select objects, to evaluate them and ideally to link them to their own questions. Many of the objects refer to inequalities in society or to gender-specific perspectives. The school students themselves determine the path through the exhibition and experience history as a complex construct. For all classes who want to spend more time in the GrazMuseum and would like to use scissors, paper and glue themselves, the workshop “Shadow Theatre” is an ideal supplement to the activity tour. The children design figures of the history of Graz and create a historical or historically modified story. The school students stage their own plays in the shadow theatre. This thematic tour focuses on the political and social radicalization in Graz in the first half of the 20th century. Engaged in a conversation with the school students, we look at museum objects which are connected to German nationalism at the end of the 19th century, to the outbreak of the First World War, to civil war-like situations in Graz during the interwar period or to National Socialism. Kommen, gehen, bleiben, weiterziehen – Stadtgeschichte ist immer auch eine Geschichte der Bewegung, des Zuzugs und des Wegzugs. Migration ist Teil der Geschichte von Graz. In dieser Dialogführung werden unterschiedliche Aspekte der Grazer Geschichte vom sogenannten Vielvölkerstaat der Donaumonarchie bis hin zu heutigen Migrationsbewegungen beleuchtet. Ausgewählte Objekte machen die kulturelle, soziale und sprachliche Vielfalt von Graz sichtbar und sensibilisieren für das Verständnis von Migration als wesentlicher Teil der Stadtgeschichte. Opportunities and rights have always been very unequally distributed in society. A look at gender relations from the Middle Ages to the 21st century makes this particularly clear. 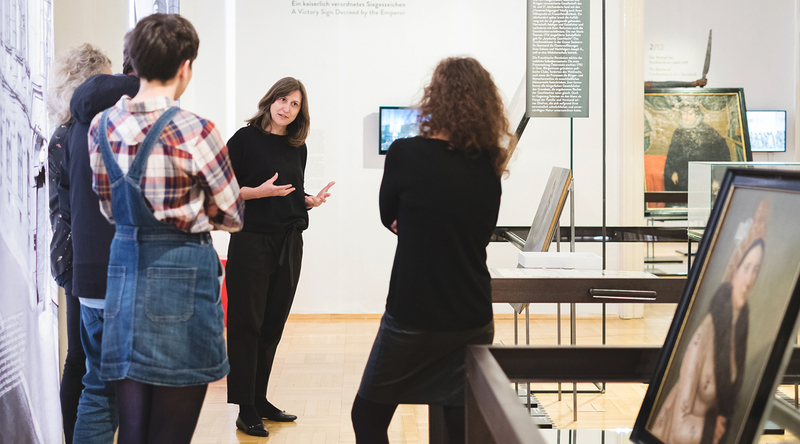 In the thematic tour we take up this curriculum topic and look at how images of masculinity and femininity have changed and which personal and political struggles are connected with it, starting from objects from the urban history of Graz. Thereby, school students are offered the opportunity to take a close look at social power structures in historical and contemporary Graz and to examine connections between gender, social position and historical context. Which languages were spoken in Graz in the past? Which references to different languages can we find in the historical objects of the permanent exhibition “360 GRAZ”? Join us with your class on an enjoyable search for language traces through the history of the city. The 30-minute introductory tours are conducted in German and are suitable for all ages. The GrazMuseum offers something special in the inner courtyard—the extraordinary collection on display of the Pharmacy Museum. This workshop is perfectly suited for young and very young school students. Specific topics are forms of medicine and effect of different medicines. On a more general level, the subject is the pharmacy from a cultural-historical perspective—prepared in a way suited for children. During the workshop, participants mix their own skin cream using historical weighing and measuring devices. The group is accompanied by two cultural educators and is split up during the practical activities. We regularly offer special guided tours for teachers who would like to prepare more intensively for a visit to the museum with their school class. At these events we provide information about the entire range of exhibitions offered by the museum and in particular about the educational offers for school students. Tour dates for teachers can also be arranged individually. Free admission, free guided tour for teachers! Make your own exhibition in the GrazMuseum? Explore a topic more closely? Work yourself as a cultural educator in the museum? Implement your own creative ideas for the museum? School students who would like to get more involved with the content and the way the museum works can get actively involved in the museum’s activities. Interested? Just give us a call! We coordinate the project days in the museum individually with you.